【Freely usage & reasonable price】 The product has a affordable price with an 8.1 inch diagonal and a weight of 2.77pound. It’s small size and light weight allow you to bring it for travailing, camping, bed-time or bus-riding recreation. 【Stylistic design】Elegant appearance with black patterned plastic cover and aluminium press keys. The screen has a 180°rotation to left side and 90°rotation to right, offering you a freewill and broad viewing scope with prominent picture. 【Game function】Equipped with Game USB for game joysticks, it provides an extra entertainment of playing game. 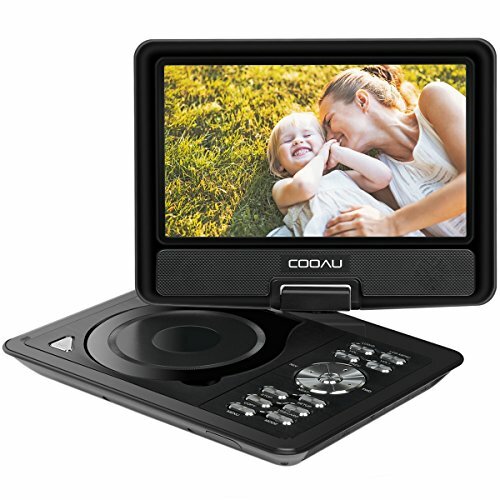 【Swivel Screen】COOAU DVD player adopts the 9.5 inch eye-protective LCD screen, resolution can be up to 800*480; Adjust the view angle freely as you need, 270-degree rotation and 180 degrees flip allows you to get the perfect view; Attach it to car headrest?–Yes; Lay flat on a desk?–Yes; Hang up above your bed?–Yes; Put it beside your bathtub?–Yes. 【5 Hour Battery】Upgraded battery capacity to 2500mAh, ensures a 5 hours play time, not enough? We also provide certificated AC power adapter and high quality car charger in our package, no worries when you are on a road trip. 【Resume Play】Enable the last memory function, you could start the movie from where you left at last time, no need to view the beginning again, which is quite convenient. 【HIGH CAPACITY BUILT-IN BATTERY】Built with 2500 mAh rechargeable lithium battery that ensures an using time about 5 hours. Battery-powered, car charger, AC power adapter three power supplies, you can play anywhere. 【SUPPORT MULTI-MEDIA】Direct play in formats:CD, DVD, CD-R/RW, DVD -R/+R, DVD+RW/-RW, VCD,SVCD (but not blu-ray DVD); It is region free. 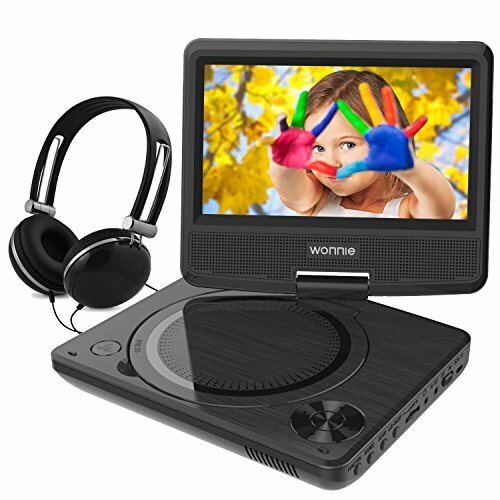 Max 32GB USB and SD Card supported: MP3/WMA/WAV, JPEG, MPEG2/AVI/DIVX. Also the Game USB for game joysticks provides an extra entertainment of playing games. 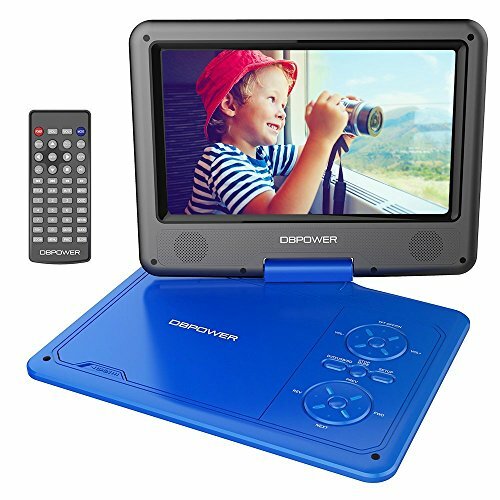 【SWIVELING SCREEN】9.5 inch 800*480 Swivel Screen with 270 degrees rotation and 180 degrees flip. Easily swiveled as a tablet to attach to the car headrest when you are on road trips. 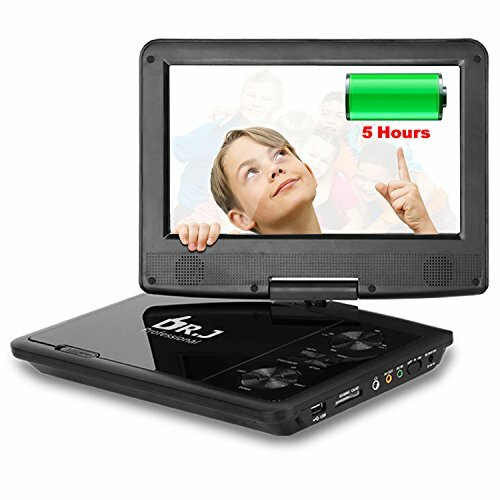 5 Hours Upgraded Battery Capacity ➤ ieGeek dvd player, built with a 2500mAh rechargeable lithium battery, ensures you can use it about 5 hours. And we also provide an AC power adapter and a 1.9m best quality car charger for your daily life and trip. 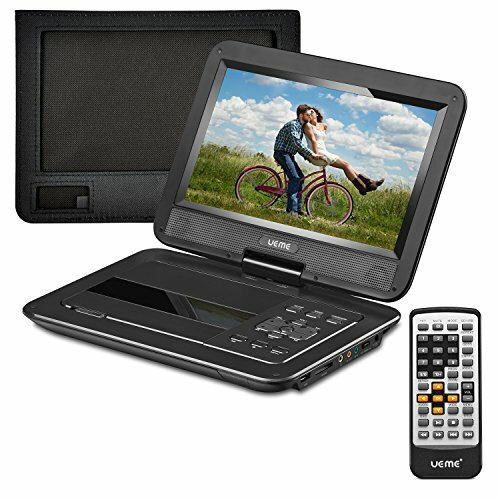 Supports Multiple Video Formats ➤ This portable dvd player can directly play DVD, DVD+R (-R), DVD+ RW (-RW), CD-R (RW), SVCD (but do not blu-ray DVD), VCD, EVD, CD, RMVB. And it also can support USB and SD cards playing. And user can copy the CD files to their USB or SD cards via ieGeek portable dvd player. 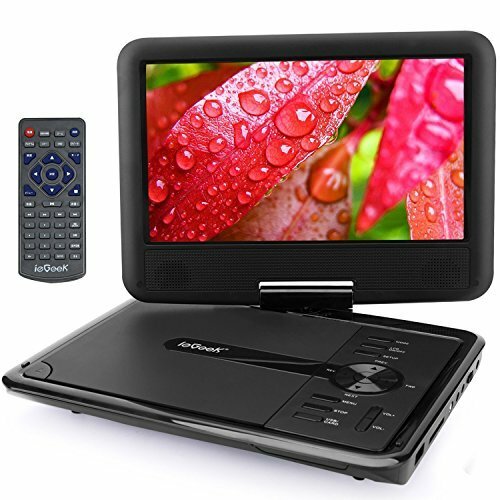 360° Swivel screen ➤ 11.5 inch 360° swivel screen with 180° flip, make it possible to attach to the car headrest. You could enjoy your time better when you are on boring road trip. INPUT & OUTPUT: input AV IN, SD card, USB thumb drive, DVD, DVD+R(-R),DVD+RW(-RW), CD-R(RW) , SVCD, VCD, EVD, CD. 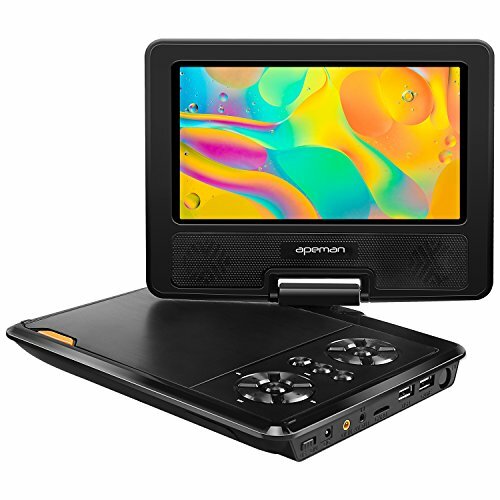 Output internal 9.5″ display, AV OU. Compatible with these file extensions RMVB, MP3, MPG, MPEG, AVI, VOB, DIVX.